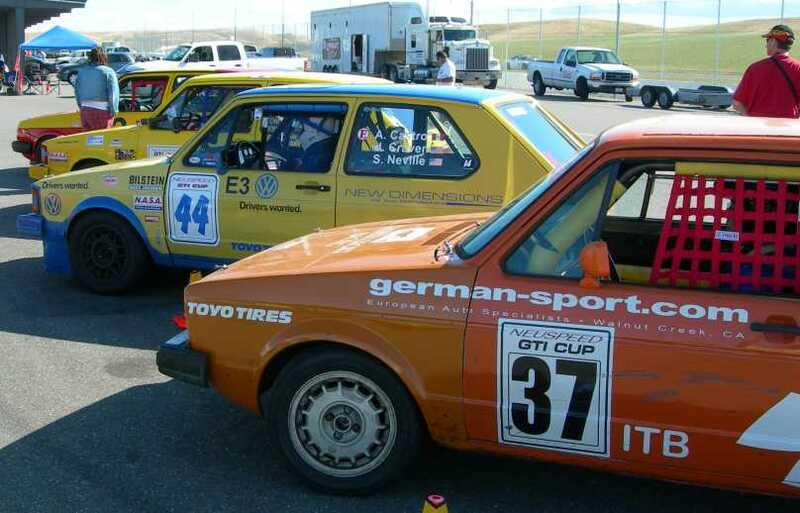 Shed Racing returned to Thunderhill Raceway Park May 27-28 for a NASA race weekend, in the GTI Cup class. 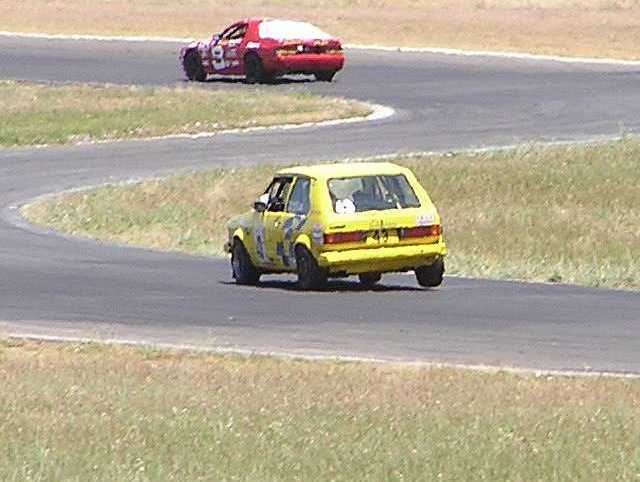 There were 4 cars in class this weekend, with Ron Swett driving Saturday, and Tom Sunday. The Other competitors included Scott Neville, Carlos Suarez, and Joe Craven. Scott of Miller Motorsports was instructing 2 students in the HPDE1, including Tom Krug, a friend of Scott Neville who was in town from Canada, and driving Scott's #44 GTI. Ron and Jason left at noon Friday to head out to Thunderhill, anticipating heavy traffic for the Memorial Day holiday. The early start time worked out well, as they traffic leaving the Bay Area was light, a they arrived at the track at 3:35pm. 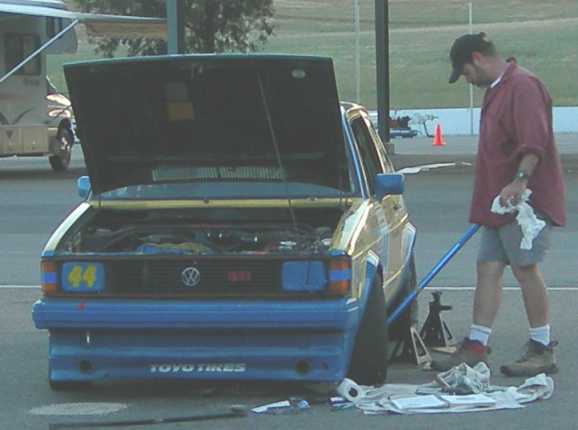 They set up camp, and got the car ready for the track by confirming the front toe setting and adjusting the camber, and generally giving everything a good once-over. Jason fabricated a sun shade for the fuel mixture guage to try and make it a little more visible on the video tape. Ron and Jason were able to sleep in Saturday, as the first item on the schedule was the Group A driver's meeting at 9 AM. Ron entered the track just before 10 AM for the morning practice session, and started out slowly for the first laps to bed the brake pads to the new rotors Tom installed the previous weekend. Carlos turned the fastest lap of the session, with a 2:16.0, followed by Scott Neville with a 2:19.0 and Ron with a 2:20.4. Scott Miller shows Tom Krug the fast way around the track, in a car totally unsuited to the task at hand. The car was still running well in qualifying, with Ron dropping his lap times into the 15s, finishing with a best lap of 2:15.0, putting him second on the grid. Carlos earned the pole, with a time of 2:14.2, and Scott qualified third with a 2:16.6. 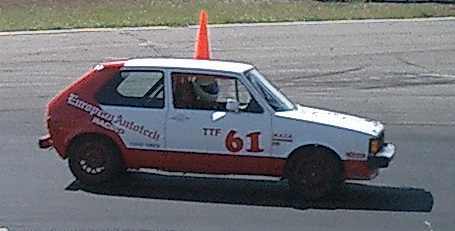 Joe Craven arrived to the track late, and his car was not through tech in time to make the qualifying session, putting him fourth on the starting grid. Tom arrived at the track just after qualifying. As Scott Neville left for the grid, Tom noticed a puddle where he was parked, which was identified as transmission fluid. He ran and informed Scott, but it was too late to do anything before the race. Scott made a decision to race anyway and hope it held together, and investigate the problem after. A botched start by the PT and Pro-7 class cars in the second wave caused the NASA officials to order a restart, forcing an additional formation lap. When the green flag finally waved, Ron was able to take the lead into the first turn, with Carlos close on his rear bumper. Scott came out of turn 1 in third, followed by Joe in fourth. Ron held on to the lead for 4 laps, when Carlos was able to get around him in turn 8 in traffic. 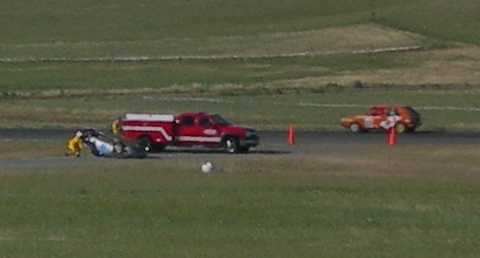 A Spec Miata went off the track after turn 6, and tried to steer himself back on track before he had slowed enough. 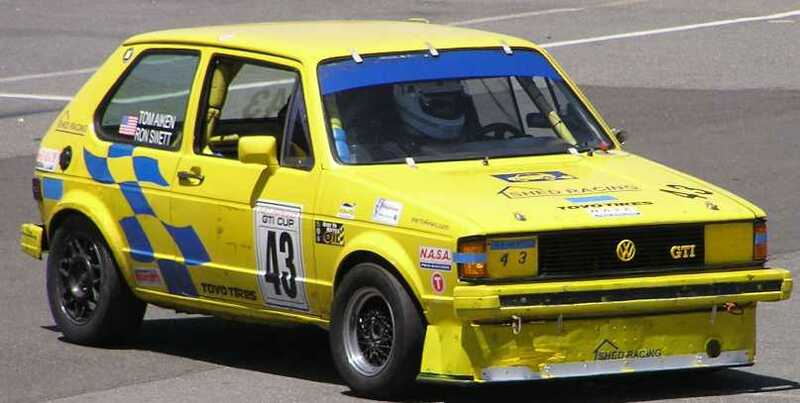 His left wheels got grip once back on the pavement, causing the car to spin across the track, where he went off sideways. 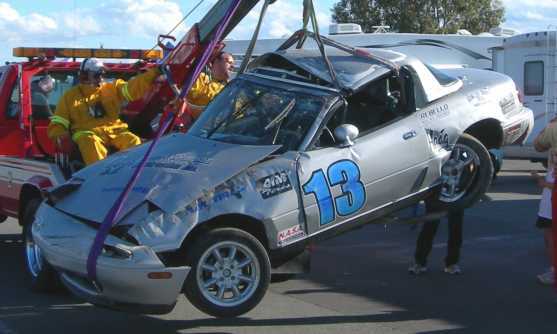 Once the car left the pavement sideways, the wheels dug in, and the car rolled several times. The crash crew reported the driver crawled from the wreckage laughing. Ron was able to keep Carlos in sight until the end of the race, finishing in second place 3 seconds behind. Scott finished third, followed by Joe. Carlos turned the fast lap of the race, with a 2:13.6, followed by Ron with a 2:13.8, Joe with a 2:14.0 and Scott with a 2:15.5. Scott Neville identified his transmission leak as an improperly installed stub axle/CV flange which had started to pull from the transmission housing. Scott was able to make the necessary repairs and have the car ready for the Sunday festivities. After grabbing dinner from the NASA BBQ, Jason, Tom and Ron went to work on the car. 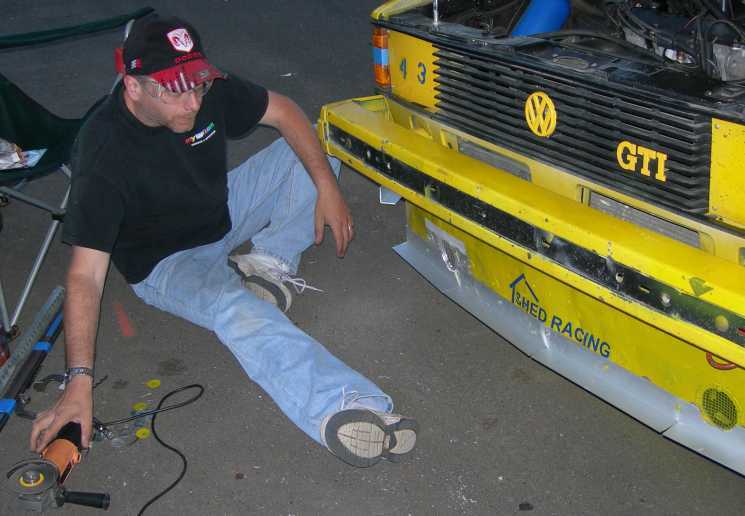 Tom brought some hardware store go-fast parts to fabricate a front splitter and an additional rear sway bar. 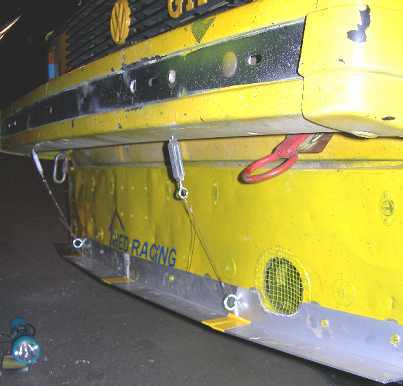 In theory, the splitter should prevent some of the air from passing under the car reducing drag at high speed and potentially reducing lift on the front end. The extra rear sway bar should increase the rear roll stiffness, reducing understeer. Tom also found a good deal on some wheels from a BMW 2002, that have slightly more offset, allowing more negative camber in the front of the car, which should increase front grip. With help from Scott Miller, everything was finished and the crew went to bed around 11 PM. Marcus of Miller Motorsports arrived early on Saturday to help out. After the customary morning coffee and breakfast burritos, Tom went out to the morning warmup session and was fast almost immediately. Carlos passed Tom in the second lap, and Tom took advantage of the opportunity to chase the more experienced driver. Tom's best lap in practice was a 2:14.5, nearly 3 seconds faster then his previous best lap. Carlos was fastest in the morning session, with a 2:14.31, followed by Joe Craven with a 2:14.34 and Scott Neville with a 2:15.7. Tom pulled into the hot pits after the session, and Marcus and Jason took tire pressures and temperatures. Based on this data, it was decided to lower the tire pressures, and remove a little camber from the left front. No other changes were made prior to qualifying. The day was hotter by the time the early-afternoon qualifying session started, and the track was starting to get a little greasy feel to it. Even so, Tom was very consistent, putting all of his laps in the 2:16.x range. His best time was 2:16.1, putting him third on the grid. Joe Craven earned the pole, with a 2:13.9, followed by Carlos with a 2:14.1. Scott Neville rounded out the field with a 2:17.5.. Tom again stopped on pit road after the session to allow Jason and Marcus to measure the tread temperature and air pressure in the tires. When Jason and the crew started the car for the Sunday race, they noticed the engine sounded like it had an exhaust leak. A quick investigation by Ron discovered a crack had developed in the header. With no time to fix it, and no way to fix it even if there was time, Tom strapped on the car and headed out to race. Starting behind Joe, on the inside of the second row, when the green flag fell, Tom tried to stay on Joe's bumper, forcing Carlos to stay outside and move into second place. This plan worked briefly, with Carlos and Tom going through turn 1 side by side. Having the outside line entering turn 2 gave Carlos a better line through the corner, and he was able to brake a little later than Tom and tuck in behind Joe for second place. Tom held on to third place, under heavy pressure from Scott Neville for the first lap and part of the second, when Scott was able to get a run coming out of turn 6 and make the pass going up the hill. Tom stuck on Scott's bumper for the next four laps, including a rather optimistic attempt to dive bomb under the 44 car entering turn 14. Scott went wide and held on to his position easily. Two laps later, some faster Honda Challenge cars caught up and passed Scott entering turn14, forcing him off line to the inside. 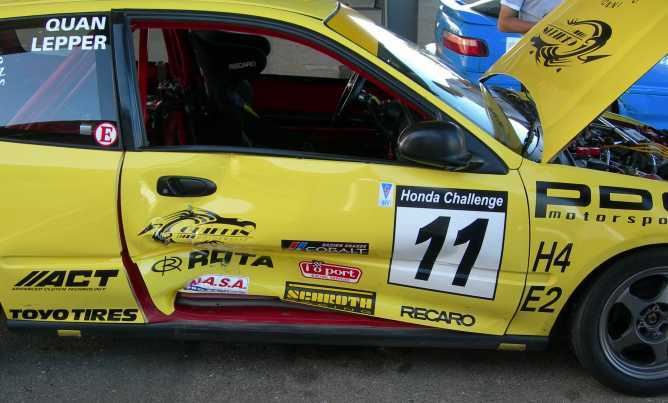 The lead of the two cars, a silver Acura got out of shape between 14 and 15, causing the second Honda Challenge car, driven by Mike Quan to take evasive action to avoid hitting him. Unfortunately Mike spun directly in front of Scott. With nowhere to go, Scott T-Boned Mike in the passenger door. Tom passed safely to the outside, and moved into third place. Mike and Scott both got back into the race, with Scott slipping back about 12 seconds due to the shunt. Joe and Carlos were flying, and had opened a nearly 30 second lead over Tom when the checkered flag fell. Joe finished First, with a 2:13.37, Carlos finished Second with a 2:13.23, followed by Tom with a 2:15.95 and Scott with a 2:15.98. 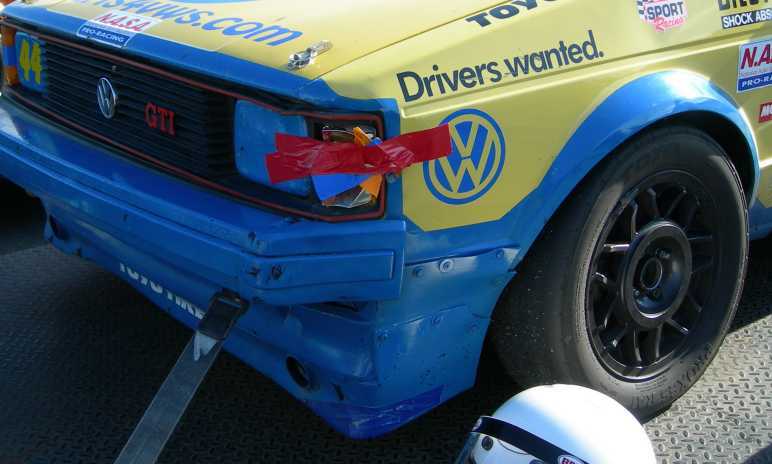 Damage to Scott's car was limited to a side marker light and a bent bumper mount, and the passenger door on Mike's Honda.